Flowers are a thoughtful and personal way to convey your love, friendship, appreciation, or support -- an ageless expression of caring. 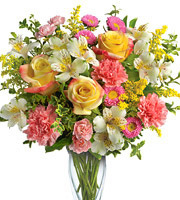 And, sending flowers on line is so easy with 1-800-FLORALS. Send your love with romantic Roses or a fresh Spring Flowers bouquet. You're sure to make quite an impression. Or, send your warmest Easter wishes with festive Easter Flowers. 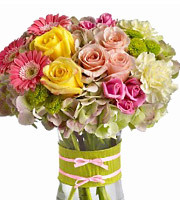 You can also select from our year-round Flower Arrangements, cheery Birthday Bouquets and thoughtful Anniversary gifts. Still looking? Shop for New Baby and Get Well or Sympathy Expressions with the click of a mouse, and be sure to check out our Best Sellers. You'll find lot's of other great gift ideas, too, including blooming and green Plants along with FTD Flowers, Teleflora Bouquets, Thank You Gifts, and Thinking of You selections. Most of our flowers, plants, and Gift Baskets are individually made by our network of florists and available for same-day and next-day delivery throughout the USA and Canada. We also offer a wonderful selection of Next Day Flowers at discount prices shipped direct by overnight courier for delivery Tues. through Fri. in the Continental USA. So, brighten someone's day with the morale boosting power of flowers delivered just for them. 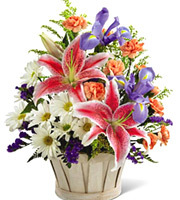 Order online, or call us toll-free, for beautiful floral gifts and professional florist delivery. Our network of quality florists makes it easy to send flowers and plants delivered almost anywhere in the U.S., Canada, or worldwide. Same-day florist delivery is normally available Monday - Saturday throughout the 50 USA states and Canada on orders received by 1:00 pm weekdays, and 12:00 noon Saturdays, in the recipient's time zone (excluding Sundays, holidays, and peak floral periods). At peak delivery periods, such as Christmas, Valentine's, and Mother's Day weeks, please order at least one day in advance, if possible. 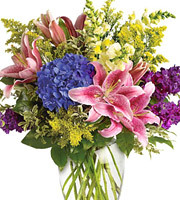 For international florist delivery outside the U.S. and Canada, see International Flowers. Celebrate Spring! Share the hope and joy of the season with the natural beauty of fresh Spring flowers for Easter (April 21), Secretaries & Administrative Professionals Day (April 24), Mother's Day (May 12), and Dia de Las Madres (May 10). Order on line or by phone today! Direct-Ship Bouquets! Save money with our Next Day Flowers by overnight courier. You'll find beautiful roses, bouquets, and plant gifts at bargain prices -- all shipped fresh and direct for delivery Tues. through Fri. in the Continental U.S.A. just for you. Direct-Ship Gifts! Check out our new Direct-Ship Gifts including exclusive items from Starbucks, Mrs. Fields, and others. They'll all available for delivery in the 48 Continental U.S. states by standard ground delivery (allow 3 to 7 business days). Say it with style. Want to make someone feel extra special? Surprise them with fresh flowers and your personal note of love, appreciation, or gratitude. Nothing says 'I Love You' like flowers. You can even order on your Web enabled Cell phone or mobile device. Love Flowers? Check out our free printable 2019 Monthly Wall Calendar. It's a great way to decorate your home or office with beautiful bouquets all year long and remember important occasions, too! You might also enjoy All About Easter Lilies, About Secretaries Week, and About Administrative Professionals Week. Make every occasion special. Whether for a birthday, anniversary, graduation, new baby, get well wishes, congratulations, thanks, or just because, flowers and plants are a wonderful way to show you care, and sending fowers for no special reason, may be the most special of all. About 800Florals. There are roughly 20,000 professional florists in North America that design and deliver fresh flowers on a daily basis. Most have one or more websites, but they are much more than just Internet companies. They're real florists with years of design and delivery experience, and their reputations have been built on their performance. Some have been in business for generations, with thousands of loyal customers. Phillip's 1-800-FLORALS is one of those. And, of the 20,000 or so total florists, less than one half of 1% consistently handle the most computerized nationwide and worldwide florist deliveries. Phillip's is one of those, as well, and has been for more than 20 consecutive years. So, if you're looking for a real florist who is small enough to care yet large enough to take good care of you, too, you've come to the right place. We think you'll notice the difference. And, we're committed to showing you over and over again. Shopping. You can shop by Products and Occasions or check out Flower Delivery. You can even arrange a thoughtful gift of Monthly Flowers for someone special. Don't see what you're looking for? Call us toll-free. And, when you need to send an expression of sympathy, our Funeral Flowers, Family Funeral Tributes and Sympathy Gifts for Home can help you make the right choice. Free Services.Send free Virtual Flowers and eCards by email to anyone with Web access. They're a great way to keep in touch. Need help keeping track of birthdays, anniversaries and other important dates? Try our free Reminder Service. Looking for a particular bloom? Visit our Flowers Glossary for popular pictures and names. Our overseas customers find this Currency Converter helpful, too. More Information. You'll find everything from flower design and decorating tips to Important Holidays and floral care tips at Flowers Information. Some of the more popular pages include the Meanings of Flowers, the Meanings of Roses and a Guy's Guide To Giving Flowers. Other great resources include Florists Online, Flowers By Wire and About Sympathy Flowers. Hospitals, Funeral Homes, & Us. We deliver to virtually every hospital and funeral home in the United States and Canada. If you're looking for a particular one, you can find names, addresses and phone numbers at U.S. Hospitals, Canada Hospitals and U.S. Funeral Homes. Still can't find what you're looking for? See Ordering & Delivery Information, try our Site map or call us today. We're real florists with more than 90 years of experience, and we look forward to serving you in any way that we can.